Even more magazines to collect! 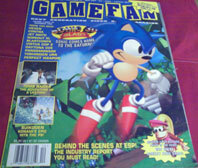 Sonic's games always create a buzz, so magazines from all over the world will use him to headline their cover-stories! This means nice Sonic-dedicated covers for you to collect. 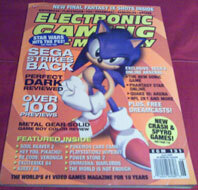 A 1999 issue of "Electronic Gaming Monthly" Featuring "Sonic Adventure"
Finally a 2006 issue of Electronic gaming monthly featuring "the 200 greatest games of all time"
But what about the article? Sonic 1 was ranked 56th best. 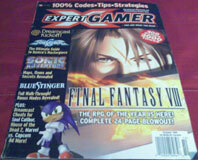 A 1999 issue of "Expert Gamer" features Sonic in the corner for "Sonic Adventure"
A 1996 Issue of GameFan featuring "Sonic 3D Blast"
A 2006 issue of "Game pro." 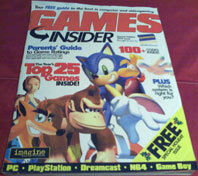 Featuring "Sonic the Hedgehog"
A 1999 issue of "Games insider" also Featuring "Sonic Adventure"
A Magazine called "Sega Visions" from 1994, Featuring Sonic 3. 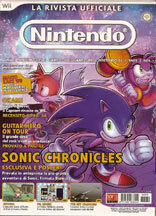 This magazine contains a map of Angel Island zone Act 1. Find 16 Hidden Islands filled with secret treasures! The DS screens that are in the middle say: Battle Captain Whisker and other mega bosses! The DS screens farthest away from Sonic say: Get vertical while pulling off tons of moves and tricks! 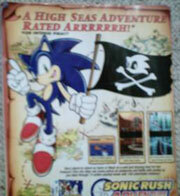 Then, the paragraph right above the Sonic Rush Adventure logo says: Race island-to-island as Sonic or Blaze on a wild and dizzying hunt for lost treasure! Dive into deep sea caves, outrun an avalanche and battle with pirates as you blast through 14 action-packed levels with 100 unlockable missions! Photo and info credit to: light_chao_11. Still, it's a strange Sonic related ad, so it must appear. 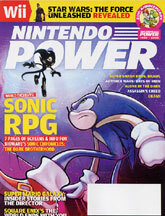 The Sonic RPG, being the first of its kind, made the cover of Nintendo Power in the USA. Here, a strange looking Sonic looks up at a mysterious creature that looks like a combination of Void and possibly NiGHTS. It tells you the official title which is "Sonic Chronicals: The Dark Brotherhood" which sounds a bit over-done...but only time will tell. Photo by SonicEmerald. Tips & Tricks is a magazine dedicated to cheats, codes and secrets rather than real news or articles. To celebrate 15 years of Sonic, they had a huge section, and dedicated their cover. Photo by SonicEmerald. 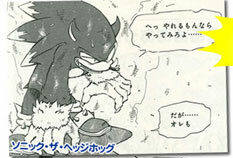 Here, you can see an interior page from the article, which makes it into SonicGear because it was really giant. 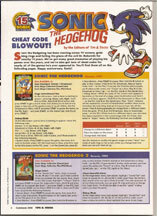 The whole feature is laid out in this manner, with blurbs, codes or instructions, as well as a photo of the game cover. 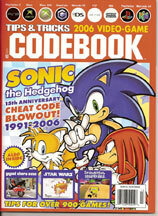 The mini-article talks about how Sonic has entertained everyone for 15 years. To the right, you can see the back cover of the magazine is devoted to a rather poor ad for the Toy Island action figures. Why is this a "Bad Ad"? Several reasons. First, what are these? It isn't obvious that they're action figures. They could be statues. Scans by SonicEmerald. Next, where do you get them? How much are they? Is there a web site? A phone number? Do they come with accessories? Are they available right now? Can you get it if you're not in the USA? NONE of these questions are answered. How are people supposed to buy these or learn more? Who knows! Just throw a photo onto anything we see and hope for the best! And not even a very good photo, at that. The Sonic figure is OBVIOUSLY meant to be viewed from a high angle, to imitate the Sonic X stock art upon which it was designed. 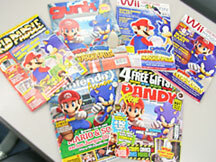 Here's a nice collection of different magazines, all featuring "Sonic & Mario at the Olympic Games" on their covers. You can see 2 variant covers for the same "Wii Magazine", there's a regular "Nintendo" magazine, but the other's names aren't too clear. Notice also that the exact same art appears on 3 of the covers, the other version on 2, and then only the far right cover is unique. Photo by SegaChannel. This is a little short comic strip from Weekly Shonen Magazine, a Japanese magazine. This mini strip is about a failing gag-cartoonist. 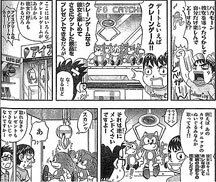 Here, he is trying to win a Sonic plush out of this UFO catcher machine. A friend (with a bandaid in his hair) is watching, and they have a somewhat large conversation as he attempts (and does not succeede) in winning the plush. Note: there is also a Tails in the machine. Comic discovered by: Fueledbychaos. Here's a panel from an upcoming mini-comic "Sonic World Adventure ". Obviously this will be based around Sonic Unleashed which has that really strange 'werewolf' type form in it, which you see here. This is rather mutant and strange but...it looks like it does in the game, so nothing can really be said. 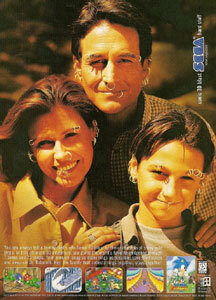 Want to collect this? It will appear in Dengeki Nintendo DS magazine.on September 9th, 2008. If anyone collects this, and it's a short strip, images will appear here, possibly with translations. Discovered by: Fueledbychaos. Send it if you get it! 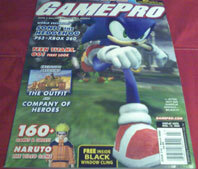 If it seems strange that Sonic is the only thing on the cover of a Nintendo Power magazine, you might be oldskool! 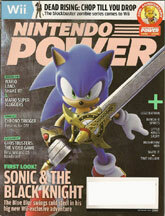 This issue of Nintendo Power (USA) has Sonic from "Sonic and the Black Knight" headlining the cover. Here Sonic has the sword (Calibur) and gauntlet from the game. The headline reads "The Blue Blur is swinging Cold Steel on the Wii". This is another 'story book' type of game like Sonic & Secret Rings where he goes into a fairy-tale style plot and takes on a sort of theme of that time. Still, it makes for an interesting cover. 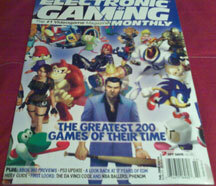 Sept. 2008 issue. 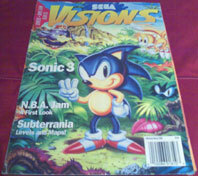 Magazine is in the personal collection of SonicGear. 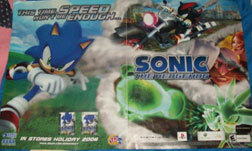 Here are 2 cool 2-page spread ads for Sonic 2006. The first one features Shadow (back on his motorcycle), wierd Eggman, Elise and Silver, who is glowing psychic green while throwing a bomb. It says "Sometimes Speed isn't Enough"
the other has only Sonic running through a city with (presumably) missile-smoke trails in the background. The Sonic graphic is nearly the same as before, only now his hand is open. This one says "Limits as you know them are about to be broken, experience a whole new blue" These could be found in various USA magazines such as EGM and PSM. 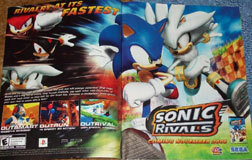 Here's a 2-page spread ad for Sonic Rivals. This one ran in PSM in the USA around it's time of release. 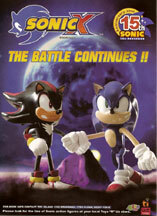 This one features Sonic vs Silver on one page, looking like they're around the Green Hill Zone or something. The other exposes Knuckles and Shadow as two of your other competitors. This game is for the PSP. All 3 ads in this area photographed by fueledbychaos.